Do Sweden and Germany hold the key to unlocking climate action worldwide? One of Europe's energy giants is about to make a decision that could set the world on course to rip coal out of the global economy - or lock it into a fossil fuel trap for decades. Sweden's state-owned energy company Vattenfall is pondering whether to offload its loss-making brown coal mines and associated power plants in Germany to a Czech energy company - EPH - which is planning to expand these operations. The Swedish parliament recently debated the issue and a decision could be made by the government in the coming weeks. By halting this unethical sale, the governments of both Sweden and Germany will also establish a bold precedent on climate action that other countries can follow. The only way of stabilising global warming at well below 2˚C is to urgently decrease global emissions and create a fossil fuel-free world economy no later than 2040-2060. Given the expectation that richer countries transition faster than developing ones, for nations like Sweden and Germany this means decarbonisation by 2030-2040. This is the end of the road for coal which, in addition to causing several hundred thousand premature deaths each year due to heart disease, lung cancer and respiratory infections and contributing 42% of global emissions of greenhouse gases, is also the easiest fossil fuel to phase out because we already have clean substitutes. The task is urgent. Unprecedented forest fires in Canada in 2016 and in Indonesia in 2015 are damaging economies and human health while accelerating global warming. Africa today is suffering from drought more severe than the humanitarian crisis in the 1970s and 1980s. 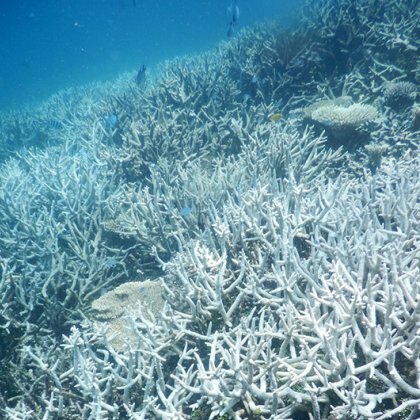 Meanwhile, record ocean temperatures are driving the most widespread and severe coral bleaching in the history of Australia's Great Barrier Reef. Great Barrier Reef: coral bleaching, Heron Island 2016. Five months after Paris it is time for Europe to "walk the talk". Germany, the world's fourth largest economy, is pursuing the world's most ambitious plan to phase out fossil fuels, the Energiewende, while simultaneously phasing out nuclear power. Sweden, a small country in terms of its share of global carbon emissions (0,2%) is best placed to succeed in delivering the UN Sustainable Development Goals and the Paris climate agreement, according to recent studies. Despite this, the climate and energy policies of both countries risk failure. Take Sweden's state-owned energy company Vattenfall, one of Europe's largest coal utilities, representing 6.6% of the EU's annual carbon dioxide emissions from coal. Vattenfall intends to sell its mines and utilities in Germany to Czech energy company EPH, which foresees an expansion in Germany of the woefully inefficient brown coal. This sale is an unethical quick fix in violation of the Paris climate agreement, the German federal government's official plan of meeting its climate targets by phasing out lignite, and the Sweden's parliamentary agreement to reduce emissions by 100% by 2045, with 15% reductions abroad. The sale includes Vattenfall's power stations Jänschwalde (pictured), Boxberg, Schwarze Pumpe and Vattenfall's 50 percent stake in Lippendorf, as well as the open cast mines Jänschwalde, Nochten, Welzow-Süd and Reichwalde and the recently closed mine Cottbus Nord. The decision has global implications. Australia, a climate laggard and the world's 2nd largest exporter of coal, is one country that will be monitoring the Vattenfall decision closely as it makes a decision on its own controversial coal project - the Carmichael coal mine in Queensland - whose future hangs in the balance. Faced with mounting evidence that renewables are a better solution to energy poverty than coal, Asian countries, which buy Australian coal, will also be watching. Instead of selling its lignite assets in Germany, Sweden and Germany must start an economically orderly phase out of coal. We suggest an agreement between PM Stefan Löfven of Sweden and Chancellor Angela Merkel of Germany in close dialogue with the lignite regions in Germany to take joint responsibility for a humane and environmentally sound phase out, creating new jobs for the 6,000 coal-related workers who would otherwise become unemployed. The coal mining Lausitz region in Brandenburg might become a pioneering "reality lab" for conversion away from coal, demonstrating how to transition away from the fossil dead end using novel technology and business models. This also makes financial sense. Swedish tax payers would gain nothing from a sale to EPH: according to EPH, Vattenfall will pay the Czech company 1.7 billion euros to allow the loss-making business to continue until an expected recovery in European power prices takes place, further undermining the Swedish and German responsibility to deliver on the Paris agreement. Vattenfall not selling its German coal assets but continuing to exploit them anyway would not be cheap either: applying the Swedish price on carbon since 1991 of €100 per tonne of carbon dioxide emitted would mean that Sweden's lignite reserves in Germany cost Swedish society €6 billion per year. It is therefore vital that Sweden and Germany do not view their decision on the Vattenfall case as purely domestic issues. Both countries have a huge responsibility to the world and a great opportunity to spearhead the world's efforts on climate by moving away from coal for good. Anything less would, in addition to breaching the Paris Agreement, fly in the face of economic, scientific and moral logic. In times like these, mistakes like those are ones we simply cannot afford to make.